Oh, God! Oh, Jesus Christ! Oh, my God! Christ! No, no, dear God! No, Christ! No, no! 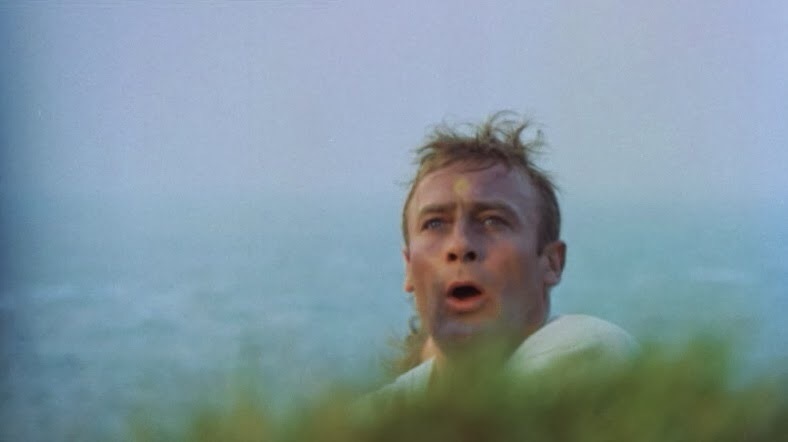 Sergeant Howie’s terrible realisation of his impending fate in the climax of the original Wicker Man was not unlike my own reaction upon first looking up, up, up at the monumental incline in front of me. OK so maybe I am being slightly dramatic. 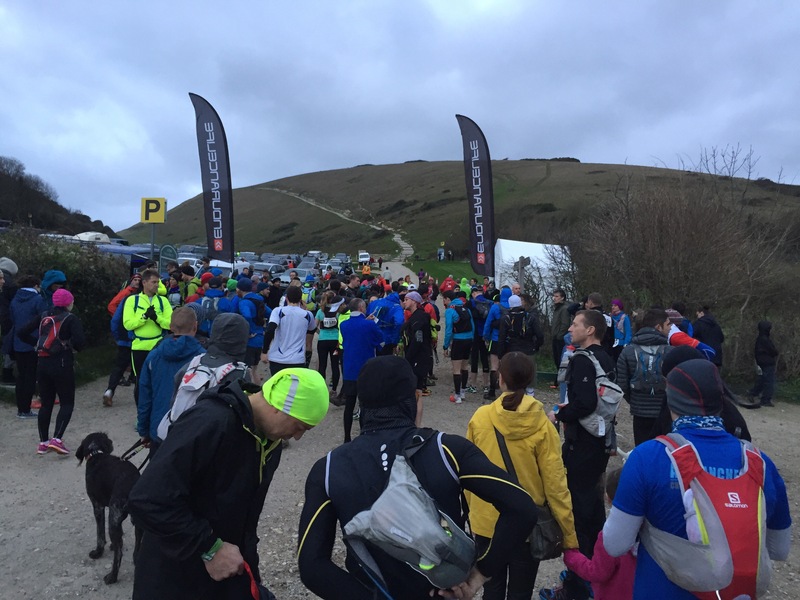 A gloomy 7.30am start in West Lulworth on the Jurassic Coast in Dorset and I was standing outside race HQ unable to neither hear the instructions from the race director nor take my eyes off the first climb. 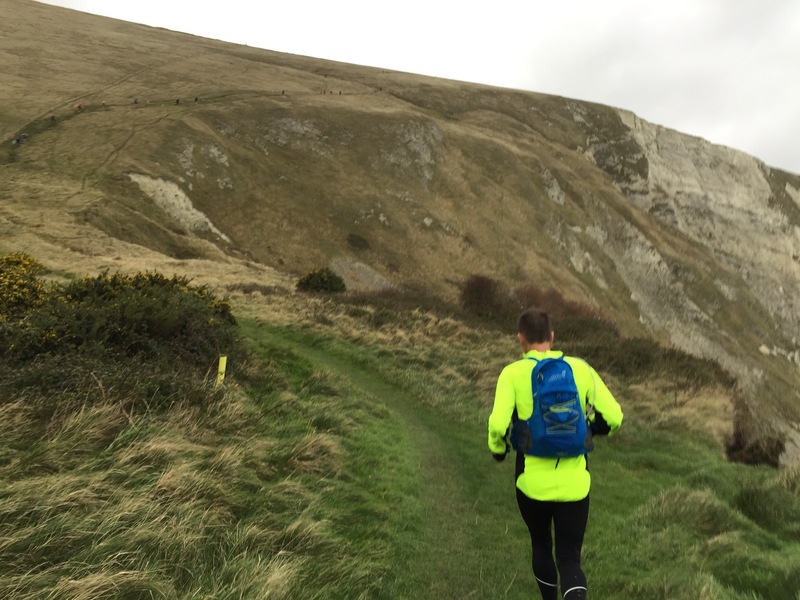 I’d already decided that I was unlikely to complete the full 45 mile Ultra Plus but now seeing the size of the mountainous cliffs in front of me, I wasn’t sure I would even be able to make it 10k. 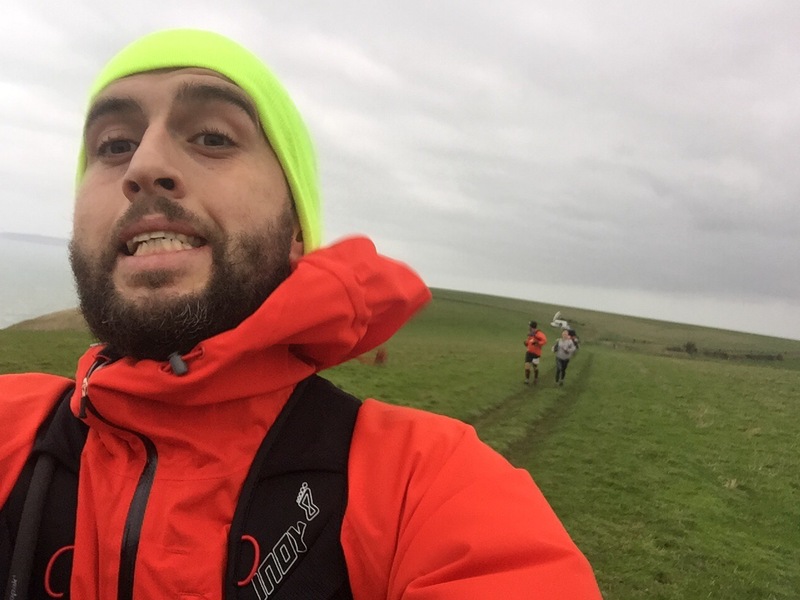 This was also my first big wintery race and I was wrapped up in base layer, waterproof coat, gloves, hat and even a Buff (I had yet to work out what it was for but everyone else seems to have one). As soon as we began the trudge up the 18.2% gradient hill from the car park, I was very glad for all of the layers. 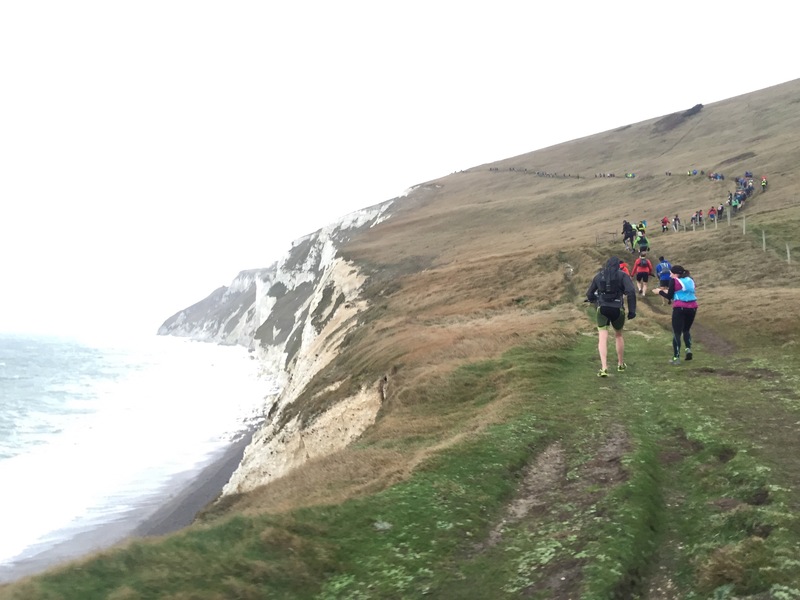 Storm Desmond was whipping up a terrible reception for the troupe of runners but once over the crest of the cliff, the run down the other side was as exhilarating as it was savagely beautiful. 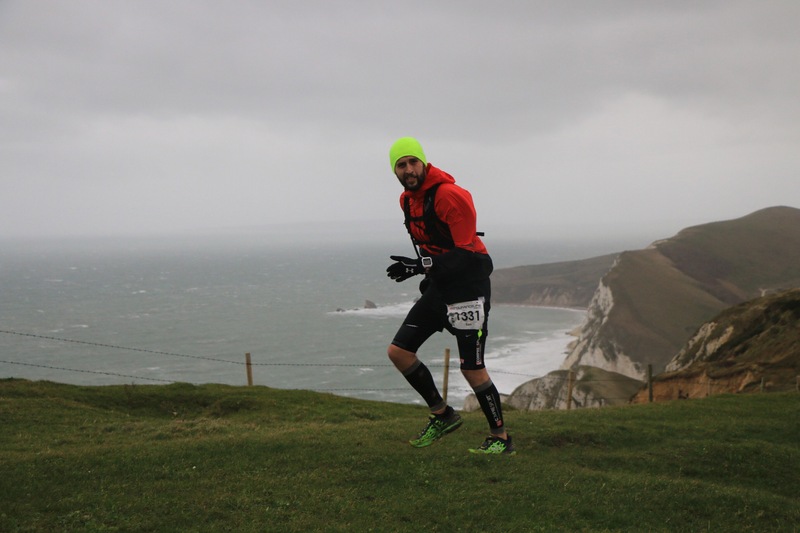 I must’ve retained some childish sense of care-free downhill running as I near flew down the hill sticking out both arms to act as a sail and letting gravity and the wind do as much of the work as possible. But as I levelled out at the bottom, smiling like a madman, I realised there might be an issue with the course; there was another huge hill in front of me, this time a 30% gradient. That’s basically one step away from needing a ladder. And behind that another hill. And then another. 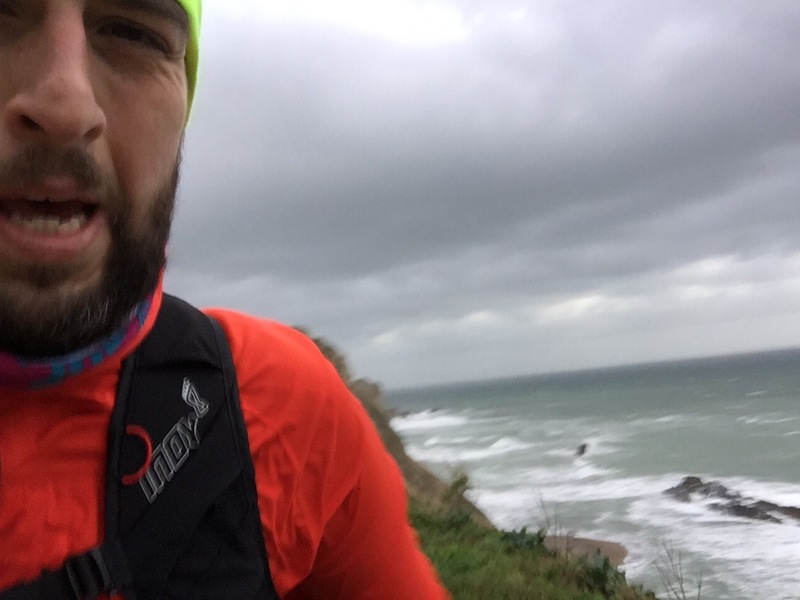 The first 12 miles were actually enjoyable to run, especially once we turned in land to gain some shelter from the wind. It was here that I began to run alongside my newest Ultra-buddy Shaun who had only taken up running 12 months previously. 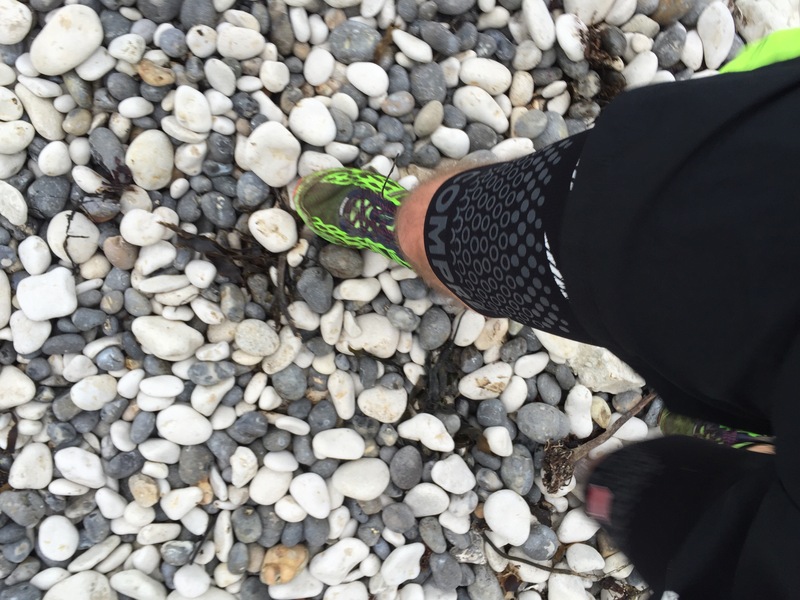 On all three ultras I have done, finding someone to run with makes everything easier and makes the time go quicker and the pains seem less. Even having seen the course profile and despite running and talking with someone, I couldn’t possibly have been prepared for the second loop of the course. 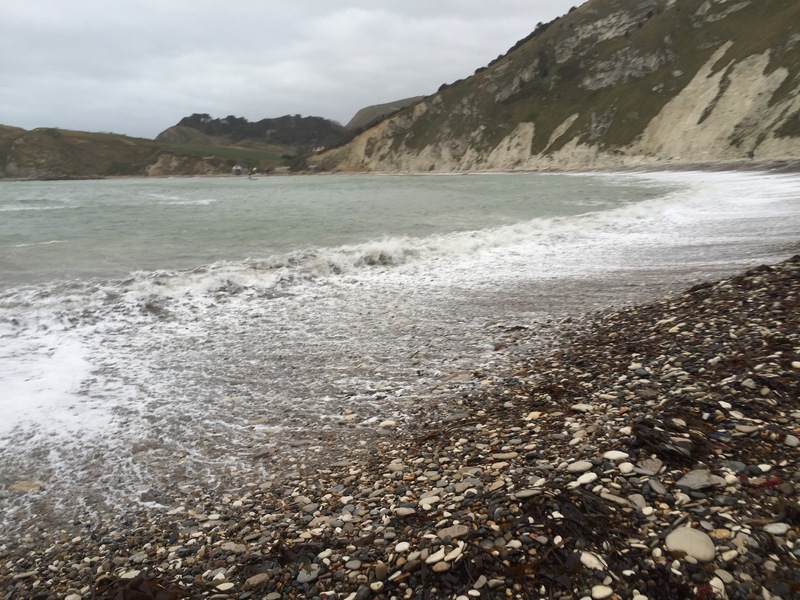 It started by heading along the pebbly beach which normally wouldn’t have been a problem but I managed to lose half of my food supplies and also fall over, slightly grazing my left knee. No big deal I thought but little did I know that this was the beginning of the end of my race. After the beach, Shaun (who had managed to get into pre-race briefing) mentioned that there was a brutal three miles coming up. I laughed at him, wondering what could have been tougher than the first two hills of the day. 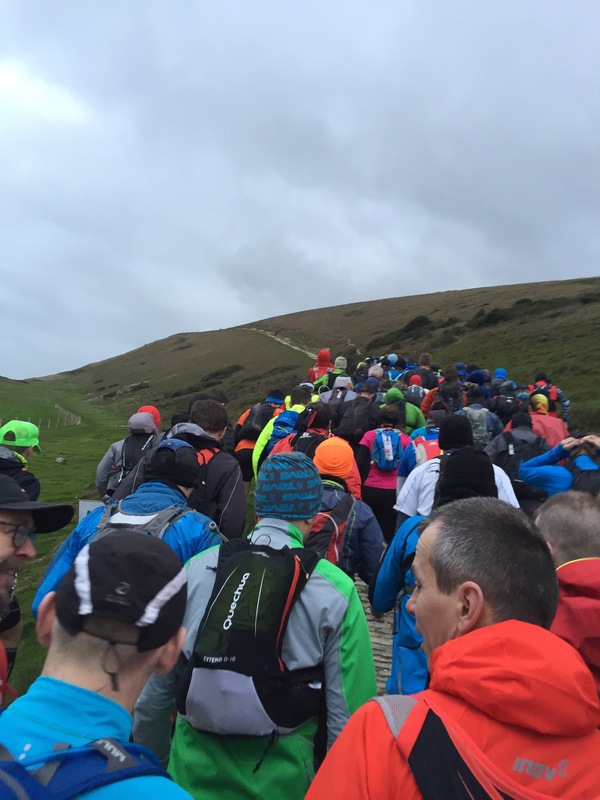 The wind was battering, the incline was around 25% and it just kept on going and going. I was blown over into the long grass and all the way up the path, runners were stopping to catch their breath from fighting the hill and the wannabe-gale. Where the previous climbs had been the precursor to fun and care-free descents, the Easterly loop only contained downhill sections that were equally savage as the up meaning miles crept along at a 20 minute pace. 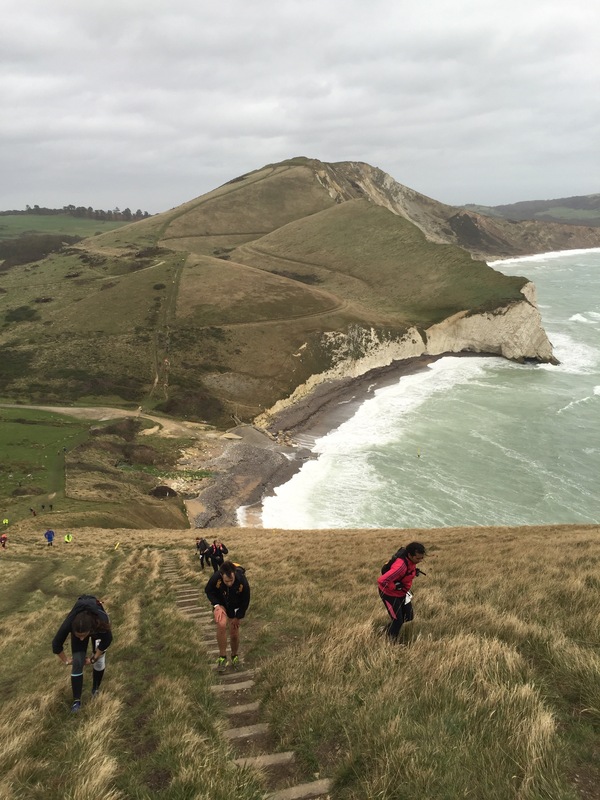 My knees began to ache from the crouching, pausing, fractured pace as we lowered ourselves back to sea level only to be hit by yet another glute-busting climb. In the few occasions that we did have a chance to run, our bodies had to lean into the wind like Michael Jackson in the Smooth Criminal video in order to maintain any pace. The wind played a further cruel trick by suddenly dropping leaving you with no resistance and inevitable fall before picking up again before you had a chance to start running. And after a few ups and downs, both mentally and topographically, my tummy began to rumble. Having stayed in an Airbnb the previous night, I hadn’t really thought about breakfast so I’d only had a rushed flapjack as I drove to the start line rather than the usual bagel and porridge. 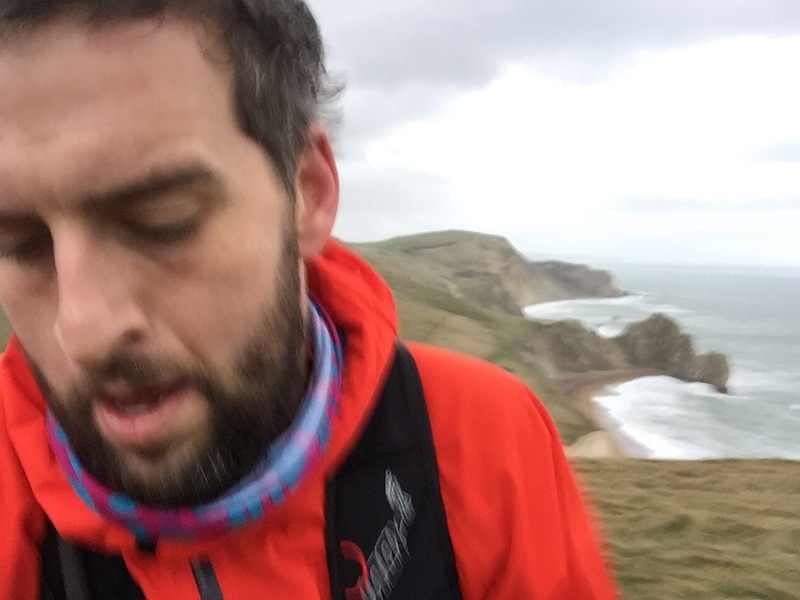 Coupled with my lost rations and higher calorie expenditure than expected (I’d forgotten to account for the hills), I was really struggling for energy. So about 18 miles into a potential 45 mile run, I decided that I would stop at the marathon distance. I realistically had not expected to make it even to that point so could DNF with some pride of giving it a go and a marathon is still an incredible achievement, especially one as alpine as this. I wasn’t bitter or annoyed. I’d enjoyed the first half and the scenery was truly incredible. The amount of food I stuffed into my face when we reached the next fuel stop at 23 miles was testament to just how much energy my body was craving. Crisps, biscuits, banana and even jelly babies (which I would normally steer clear of as they’re usually not veggie) were inhaled and almost instantly I felt better. I even think I could’ve gone on slightly longer but with the wind, the lack of training and poor nutrition choices, I knew that pulling out was the right decision. So by the time we traipsed across the beach, I was comfortable withdrawing but didn’t want to take the medal that was offered as I hadn’t completed what I’d set out to. Instead, I’d spent six gruelling hours in the company of Mother Nature’s best and worst but was immensely glad that I chose to enter. I will definitely be heading back to conquer this one next December!